It’s fully integrated software with the company sales, inventory and accounting, gives you real time statistics and consolidations amongst all shops without the hassle of integrating several applications. The Point of Sale -POS accepts Cash, Cheques and Electronic Card payment methods are available. New types of payment methods can be added as well. Credit Card and Electronic payments are handled by external payment terminals. A single POS-order can be paid with in separate payments, and with separate payment methods. Generate and print POS invoices for your business customers. For easier bookkeeping all payments are directly integrated into Odoo Accounting. Accept customer extra tips or convert their change to a tip. Advertise your promotions, opening hours and events on your printed receipts. Quickly find your customers and products with the built-in search engine. Manage multiple cashier account and secure them with badges or pin codes. Pre-configure your franchises stores, overview their sales and centrally manage their stock and accounting. Register Customers: Identify your customers, register their email and contact address. Offer them discounts and keep track of their sales. Identify Customers Find your customers with the built-in search engine or identify them with a barcode printed on their loyalty card. Business Customers :Register your customer’s VAT number and print them invoices. Loyalty Cards :Reward your customers with loyalty points, and exchange them for gifts and discounts. Points can be earned by product, by order or by sale amount. Assign orders to tables and overview your restaurant’s floors. Make changes on the go with the graphical editor. Keep track of your guests and oveview your restaurant’s capacity and available tables. Take orders for different courses at once, and send them for printing at separate times. Take note of your customer’s special requests and send them to the kitchen and bar printers. 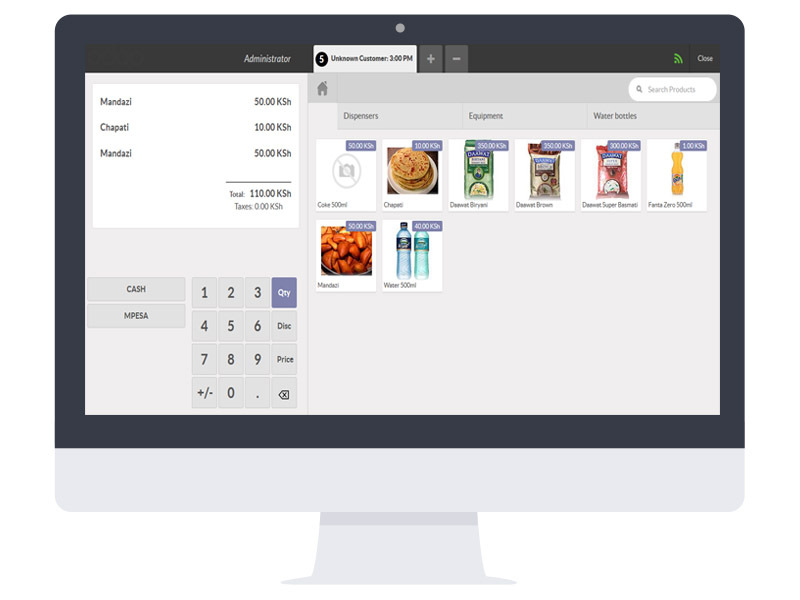 Organize your products with hierarchical product categories. Order them by popularity, display different categories in different point of sales. Quickly find products by their name, barcode or description with the built-in search-engine. Sell your products with different units and update your stock accordingly. Sell different variations of the same product with product variants. Open enterprise Point of sale performance scales to about 100,000 products. Open Enterprise POS is a Web Application, it can be deployed on any device and OS running Chrome, Firefox or Safari. Open Enterprise Point of Sale -POS is best used on a recent iPad or Android Tablet of comparable size and performance. Open Enterprise Point of Sale -POS can also be used on regular computers and industrial touch-screen terminals. Open Enterprise Point of Sale (POS) will keep working while offline. The web browser can be closed offline without loss of data.